your hairbrush is not necessarily cause for alarm. Involutional alopecia is a natural condition in which the hair gradually thins with age. More hair follicles go into the resting phase, and the remaining hairs become shorter and fewer in number. Androgenic alopecia is a genetic condition that can affect both men and women. 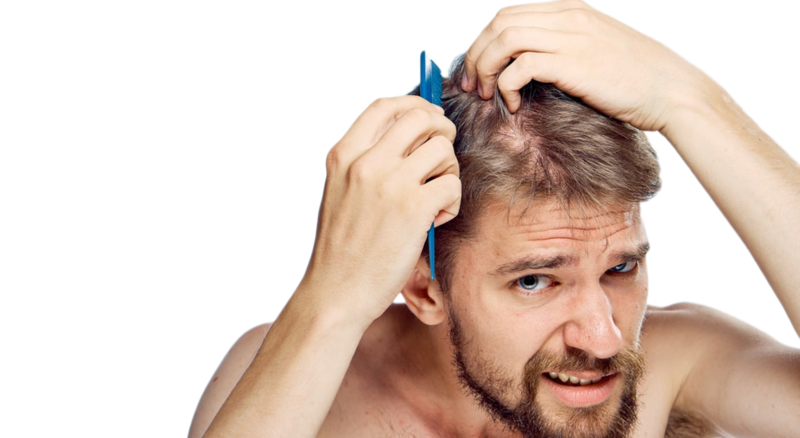 Men with this condition, called male pattern baldness, can begin suffering hair loss as early as their teens or early 20s. It’s characterized by a receding hairline and gradual disappearance of hair from the crown and frontal scalp. Women with this condition, called female pattern baldness, don’t experience noticeable thinning until their 40s or later. Women experience a general thinning over the entire scalp, with the most extensive hair loss at the crown. Alopecia areata often starts suddenly and causes patchy hair loss in children and young adults. This condition may result in complete baldness (alopecia totalis). But in about 90% of people with the condition, the hair returns within a few years. Alopecia universalis causes all body hair to fall out, including the eyebrows, eyelashes, and pubic hair. Trichotillomania , seen most frequently in children, is a psychological disorder in which a person pulls out one’s own hair. Telogen effluvium is temporary hair thinning over the scalp that occurs because of changes in the growth cycle of hair. A large number of hairs enter the resting phase at the same time, causing hair shedding and subsequent thinning. Scarring alopecias result in permanent loss of hair. Inflammatory skin conditions (cellulitis, folliculitis, acne), and other skin disorders (such as some forms of lupus and lichen planus) often result in scars that destroy the ability of the hair to regenerate. Hot combs and hair too tightly woven and pulled can also result in permanent hair loss. two ears) is permanent. Donor are hair never falls down. Hair transplantation is a serious surgery, moving the donor area hair grafts onto the bald areas at the front, top and back of head. Hair transplantation must be done in hygenic hospitals to prevent all the risks and it should be operated by very experienced medical teams to avoid unnatural and unsuccessful results. We only use FUE (Follecular Unit Extraction) method while collecting the grafts. So, there is no pain (local anesthesia is applied) and there is no cut on the skin of the head just like the old FUT method. If your hair is suitable, we can transplant your hair WITHOUT SHAVE. In FUE (Follicular Unit Extraction) method the hair roots are extracted by special tipped microengines under local anesthesia and transplanted into hairless areas by taking the natural hair grow angle. Today most of the hair transplantatiın operations are made through FUE technique. Since it is not a surgical operation the patients can decide easily and prefer this technique. In FUE method the hair roots are extracted one by one and transplanted to hairless areas. Before the follicular extraction operation the hair on the donor area is shortened to 1 mm. Local anesthesia is applied on the area of extraction and transplantation. Micro motor tip approaches as to center the hair root and according to the development angle of the hair pricked into the skin and pulled back. The hair is cut in a cylinder shape together with the surrounding microscopic tissue. The follicular unit is being pulled gently by a micro forceps. This automated system which reduces the graft waste to minimum also reduces the operation time and increase the graft number. The collected follicular units are being placed into tiny holes on the hairless skin. Each follicular unit contains 2-3 follicules. On the area where the grafts are extracted, the tissue is not extracted but only the related rootcell is extracted. No cut and stitches on the extraction area. Scars smaller than 06-07 mm occur on the extraction area which will be vanished in a couple of days and heal without any trace. Throughout this method, the grafts extracted from the nape can be used in hair transplantation as well as in eyebrow, mustache and beard transplantation. In one session, according to the condition of the donor area and according to the number of roots to be transplanted, 3.000 and 5.000 grafts can be extracted. Each graft contains 1-5 strands. 1 graft is considered as 2,5-3 strands. Depending on the gathered number of roots and baldness, it is possible to transplant 50-60 hair roots per square centimeters. Many medical teams use razor blades while opening the holes onto which the hair grafts will be inserted. If you cut the skin with razor, the wound heals slow and the result is bloody. We do not use razor. We use special sapphire tools which are very tiny. We can open micro holes, so that more grafts can be inserted, so you will have more dense hair rather than usual FUE hair transplant. The wounds heal in a short time, so that you can get back to work and life very quick. DHI means “Direct Hair Implant”. A special pen called Choii Pen is used while transplanting the grafts. The grafts are inserted one by one by inside the choii implanter pen by the medical team and the doctor clicks on the top of the pen. This way, the holes are opened and the grafts are inserted onto the holes at the same time. Very practical process because of the hole opening and graft inserting are done at the same time. Very natural looking result because of the practical usage of the choii implanter pen which enables to find the right angle of the hair while inserting it. Very dense hair can be transplanted. No damage on the head. Very quick recovery time because of the easy “one- click” opening of the holes with a tiny pen. In this method, there is no need to shorten the hair. When the treatment is only carried out by certified specialists.The sharp tool previously used was replaced by a fine needle that drops the hair follicles vertically into the transplanted area, thus controlling the angle of hair position and growth. This technique enables us to plant more follicles per centimeter, so that the number of grafts grown between 70-80 grafts per centimeter instead of only 40 grafts were available using cleft technology. This kind of treatment can give you natural hair results, and you can find growing at a rapid rate – just as it is the case with a healthy scalp.